Federal law allows nearly anyone to translate for voters. At polls, it can be a different story. Dona Kim Murphey volunteered for the first time this year as a Korean-language interpreter, helping out at an early voting day in late October in Harris County, Texas. But Murphey said she and others were told to remain beyond a 100-foot line outside the polling center after assisting some voters with their ballots. An election worker, she said, had grown concerned that a group of Korean-American high school students greeting voters may have been electioneering. “She was worried that we were and couldn’t confirm that we weren’t, other than to go by our word,” Murphey said. While some experienced issues on Election Day like broken machines, voter confusion and long lines, others faced obstacles in getting language assistance, community advocates say. In DeKalb County, Georgia, 65-year-old Jin Kwon and his wife, both Korean Americans with limited English proficiency, encountered difficulties when they tried bringing in an interpreter from Asian Americans Advancing Justice-Atlanta (Advancing Justice-Atlanta), a nonprofit, court filings purport. At issue was a Georgia state law requiring interpreters to be either registered voters in the same precinct or eligible family members. Because federal candidates appeared on the Nov. 6 ballot, federal law gave Kwon and other voters wider latitude in whom they could choose to translate for them. That, in turn, caused confusion for some poll workers about which rules to follow, alleges a federal suit brought on Nov. 29 by Advancing Justice-Atlanta and others. Following a delay, the Kwons got to vote with their interpreter. And a day after the lawsuit was filed, Georgia Secretary of State Robyn A. Crittenden settled and agreed not to enforce the state’s more restrictive language assistance law in future elections, including a run-off that took place in early December. “It’s a significant victory,” said Phi Nguyen, litigation director at Advancing Justice-Atlanta. Jerry Vattamala, director of the democracy program at the Asian American Legal Defense and Education Fund, a civil rights group, said that while some jurisdictions were missing interpreters on Election Day, they did not encounter any voters who were prevented from receiving assistance from an interpreter that they brought with them. AALDEF surveyed over 8,000 Asian-American voters in 14 states and Washington D.C. on Election Day, Vattamala said. Ultimately, it’s the Census Bureau that decides which jurisdictions are to provide language assistance to which groups of voters based on a formula in the federal Voting Rights Act, according to the Justice Department. Harris County, which includes the city of Houston, is required to offer election information and assistance in Spanish, Vietnamese and Chinese, according to the most recent determinations. A jurisdiction is covered if, among other criteria, it has more than 10,000 U.S. citizens of voting age in a single language group, the Justice Department said. Korean did not make the list in Harris County. Murphey, a board member of the Korean American Association and Community Center of Houston, a nonprofit that helped organize the early voting day, said they’ve supplied volunteer interpreters in the past and never had a problem. Murphey said she got a call on the afternoon of Oct. 28 about some high school students who were at a polling location the day the early voting was taking place. She later learned that the students planned to meet and greet Korean-American voters at the door, to let them know about how the machines work and that interpreters were there to help. But they were also apparently told to collect names, under the belief that it might help secure a Korean-language ballot in the future, Murphey said. But the students continued to talk with voters, prompting a poll worker to tell them they also couldn’t say anything, according to Murphey. Eventually, they were instructed to stay beyond a 100-foot line, and Murphey, who came outside after assisting some voters, was not permitted back in the center, she said. Douglas Ray, special assistant county attorney at the Harris County Attorney’s Office, said in a phone interview that volunteer interpreters, who swear an oath each time before helping a voter, must leave the building and go back outside once they’re finished offering assistance. Poll workers, according to Ray, discovered Korean-language interpreters inside the community center soliciting voters. “If it’s not somebody that the voter has specifically brought with them to try to vote, we always require those folks to stay outside the hundred-foot limit, so that they can certainly offer their assistance to the voters as they appear at the polling place,” Ray explained. Murphey said election workers did not know where to put her, adding that they suggested she sit outside in the hall. Ray said the fact that Korean was being spoken exacerbated things. In the Georgia incident, Kwon had contacted Advancing Justice-Atlanta a day before Election Day to ask for language assistance after seeing an ad for their services on Korean TV, court papers said. During training, the nonprofit informed interpreters about language assistance provisions in both federal and state law, the suit said. For federal elections, Georgia’s state law mirrors the Voting Rights Act, allowing voters “unable to read the English language” to choose anyone — except their employer, an agent of their employer, or an officer or agent of their union — to assist them in voting, according to the suit. But when no federal candidate is on the ballot, those voters have a more restricted pool of people from which they can receive assistance. That includes only a registered voter in their precinct, an immediate family member, or their caretaker, the court filing said. Moreover, those offering help can assist no more than 10 voters in a local or state election. As for Kwon’s interpreter, she was asked to write her name on a form indicating that she was helping him, the court filing said. She was also instructed to check off a box saying she was either a registered voter in the same precinct or an eligible family member under state law. The interpreter, however, explained that the state provision didn’t apply in this instance because it was a federal election. The back-and-forth resulted in a 15-to-20 minute voting delay for Kwon as election officials sorted everything out, according to the lawsuit. Advancing Justice-Atlanta filed the complaint ahead of a Dec. 4 run-off for Georgia secretary of state, fearing that because no federal candidates were running, limited English proficient voters might be disenfranchised. For that contest, Nguyen said there was still confusion among some poll workers, but issues were mostly resolved quickly. Brad Raffensperger, a Republican, won in that Dec. 4 run-off. Nguyen also said she was surprised at how fast the suit had been settled by Crittenden, who was appointed in November to replace former Georgia Secretary of State Brian Kemp, the winner of Georgia’s gubernatorial election. 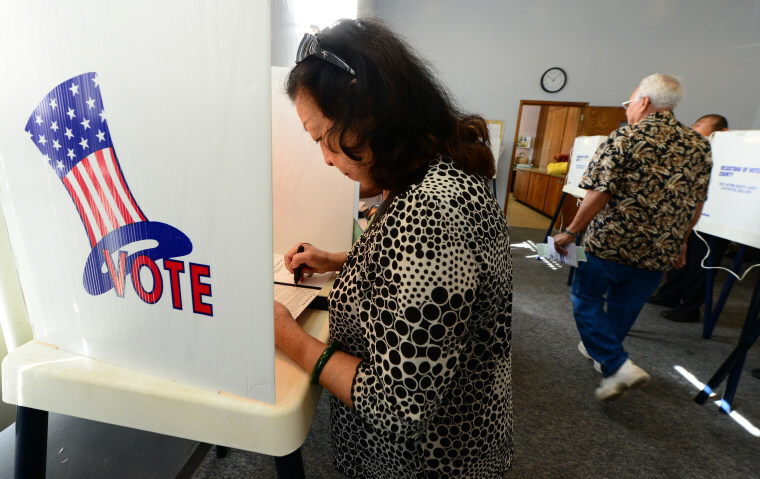 “People are now entitled to cast a meaningful ballot in a language that they understand,” Nguyen said. Around 3 percent of all households in Georgia have limited English proficiency, according to census estimates.